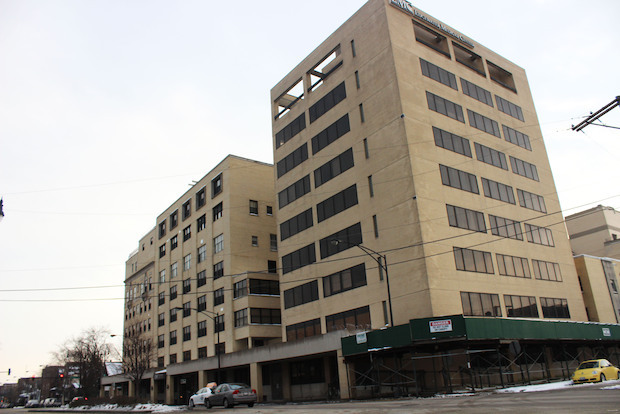 EDGEWATER — Edgewater Hospital, a neighborhood "eyesore" for years, would be home to housing, retail, parking and a badly needed park under a proposal now headed to the city for approval, officials said. The plan — assembled by Waveland Partners, which manages the bankrupt estate that owns the hospital — calls for a 12-story structure with 214 units facing Ashland Avenue; land donated for a park; and a row of single-family homes along Edgewater Avenue, Ald. Pat O'Connor (40th) at a public meeting held Wednesday night. The main structure would include street-level retail and two stories of parking, he said. But O'Connor said construction on the "eyesore" is still "several years away." The planned development proposal has to make its way through two city commissions and the City Council before an investor would consider paying for the development, he said. Ald. Pat O'Connor (40th) addressed neighbors about a planned development proposal unveiled at a community meeting Wednesday night. "We just want to get this right," he said. The site has sat vacant at 5700 N. Ashland Ave. since 2001 after the owners went bankrupt and were eventually indicted for allegedly not paying a court-ordered judgment of $188 million to creditors. Residents in the area claim the empty buildings on the former hospital campus are not only a blight on the neighborhood, but also a safety hazard. In March 2011, two children were hurt on the roof of the hospital after a transformer exploded. Since 2009, O'Connor has hosted meetings with Waveland Partners and the community to review development plans. Previous proposals were a long way off from gaining community support, including suggestions for a 14-story, 500-unit structure in 2010. O'Connor said the development group had finally gotten to a proposal that "we can work with. 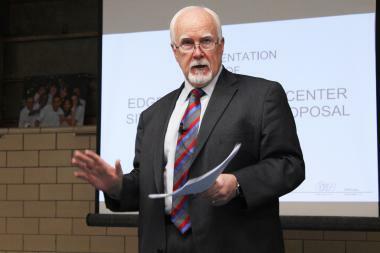 "It’s been empty and it's been deteriorating for a number of years," he told dozens of community members crammed into the cafeteria at St. Gregory's High School. "We need to move this forward." One of the biggest victories for the community was successfully advocating for any proposal to include space for a park. Chris Swan, one of the founders of Friends of West Edgewater Park, and other community members had originally demanded that the entire property be converted into a park early on in the process. "There’s not a place to get together and just be," he said at the Wednesday meeting. "Our community is just dying for a place to be." But the proposal to turn about a third of the site into a park was satisfactory to Swan. The Chicago Park District has agreed to take the title of that portion of the land, O'Connor said. "I'm actually pretty excited about this," Swan said. "This is a net positive for the community." During the meeting, a community member asked the alderman about whether retailers had shown interest for the plan's nearly 14,000 feet of retail space. It was still too early to begin courting retailers, he said, but "I’m not holding my breathe for a Trader Joes."